Manufactured in Etats-Unis from 1929 until 1933. The Petite series (which differs only in colours) is technically based on the Vest Pocket mod B. Metal parts have been painted, bellows and leatherette have been coloured. From the austere black we go to a colours palette, gray, green,Lavender and pink, this one is blue. It is possible that the model presented has undergone a replacement of its bellows by another taken from a Vest Pocket. 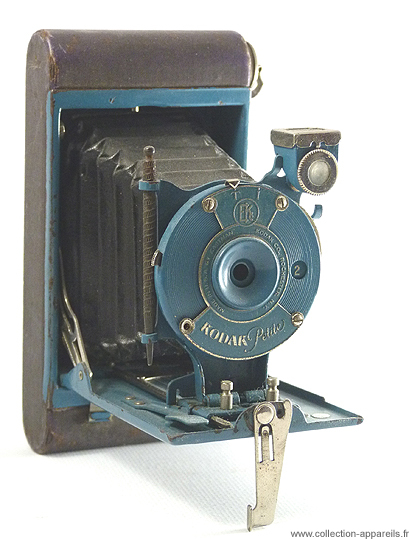 Originally, this model was sold together with a case of the same colour.